This is the easiest thing to do with garlic. And the most delicious. Ever. We roasted a whole bunch of bulbs of garlic this evening for dinner tonight. When garlic is roasted it gets so mellow, sweet, and soft. It is so soft that you can just squeeze it out of the cloves and use it in any thing you want. I have used it in mashed potatoes, bread, on toast, or on baked potatoes. It seems like there would be many more possibilities. 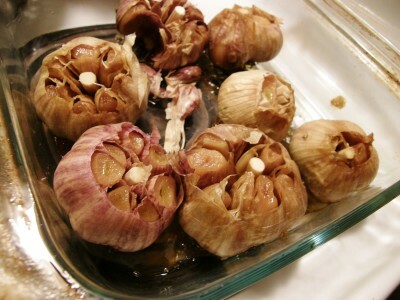 To make roasted garlic: Take as many bulbs of garlic as you want to use. With a sharp knife cut off the stem and the very top of the clove wrappers. Place in a baking pan(or if you like simply wrap in foil) and drizzle with olive oil. Cover with foil and bake at 350 degrees for about 45 minutes to 1 hour. While the oven is on throw in some potatoes to bake, then top with the roasted garlic! 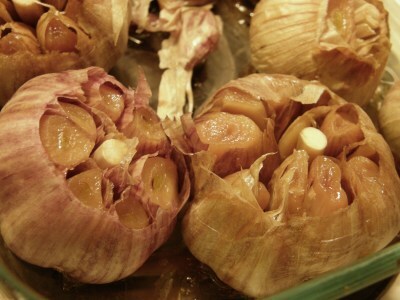 Take as many bulbs of garlic as you want to use. With a sharp knife cut off the stem and the very top of the clove wrappers. Place in a baking pan(or if you like simply wrap in foil) and drizzle with olive oil. Cover with foil and bake at 350 degrees for about 45 minutes to 1 hour. Remove from oven and allow to cool a little bit before using. To use peel cloves or simply squeeze garlic out the top.